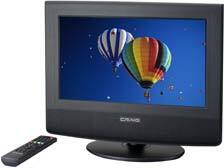 CVS is going to have Craig 17″ LCD HDTV’s on sale from $199.99 to $49.99 starting today through Sunday. Your CVS is not guaranteed to have any, but I imagine they will go fast for those that do. These TV’s also have an HDMI and VGA jack so that you could use it as a computer monitor if you wanted.